Unless I mix up with another case of the same era – which is possible but I think it is the right case – I believe I had read about this story many years ago. What I had kept in mind was that it was this case which prompted a change in the configuration of visiting rooms in prisons. 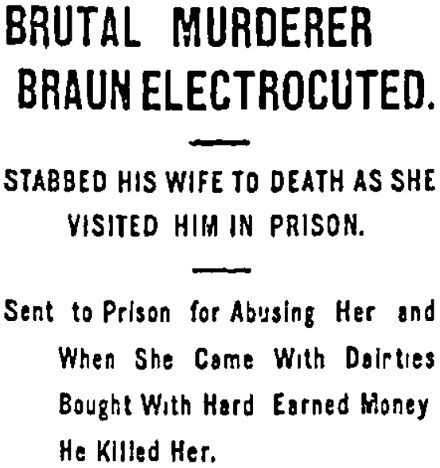 When Braun was visited in prison by his wife there was no physical separation. The prisoner and the person coming to visit him were in the same room and could touch each other. This is how Braun was able to stab his wife. I think to have read that one consequence of this case was that many prisons redesigned visiting rooms so that the prisoner and the visitor were separated at least by a table, each person being on opposite sides and no space under the table – to avoid objects being passed from one to the other or weapons such as knifes being hidden or used. Later there were even – at least in certain prisons, I don’t know in detail – a vertical plexiglas wall separating the two persons. So that they are not in the same room exactly and have to use a telephone – as we see in episodes of TV series with scenes in prison. Or perhaps there are holes in the plexiglas wall to allow communication. In some countries – here in France for instance – there used to be such separation devices in prison visiting rooms, until a more humane Garde des Sceaux – Minister of Justice – ( Robert Badinter in France in the 1980s ) ordered them to be removed to allow physical contact between the prisoner and his or her visitors. Under surveillance as one may expect. It is hard to definitely choose one system or another. One has to conciliate the safety of the visitors and prisoners and their need to have physical contact, to hear the voice of loved ones.